In the Gǝʕǝz reading in the synaxarion for Yäkkatit 12 is a commemoration of the Archangel Michael, specifically with how he is said to have been involved in the life of Samson, who is here called a giant. For the benefit of those studying Gǝʕǝz, here is the short passage, the text taken from PO 45: 528, 530 (ed. Colin), with some vocabulary and glosses. Today (Old Style, Dec. 4) is the commemoration of Saint Barbara (and her companion Juliana). Greek, Armenian, and Syriac texts are listed at BHG 213-218 and BHO 132-134. In addition, there are truncated notices of the synaxarion in Arabic (ed. Basset, PO 3: 403-404) and Gǝʕǝz (ed. Grébaut, PO 15: 651-654, with the sälam on 674-675). This Georgian icon of the saint has the following inscription at the bottom in asomt’avruli: წმიდაო ქალწულ-მოწამეო ბ(არ)ბ(ა)რე ევ(ედრ)ე ღ(მერ)თსა ჩუენთჳს (“O holy virgin-martyr Babara, plead with God for us!”). Well known is the metamorphosis (Verwandlung) of Kafka’s Gregor Samsa “zu einem ungeheuren Ungeziefer”, but in this hagiographic episode we have another metamorphosis, a change into beetles thanks the curse of a saint! Prior to the part of the narrative I want to focus on, mainly for its fantastic elements, Barbara’s father, who is not a Christian, has hired some craftsmen to make a bath — balani in Syriac, but a tall tower (πύργος ὑψηλός) in Greek — in her name with two windows, but his daughter, who is beautiful, of course, and a Christian, in her father’s absence orders the builders to add an extra window, so that when he returns he finds three windows, an obvious index to the Trinity. Below I give part of the next part of the story in English, translated from Syriac; the corresponding Greek text is in Joseph Viteau, Passions des saints Écaterine et Pierre d’Alexandrie, Barbara et Anysia, publiées d’après les manuscrits grecs de Paris et de Rome, avec un choix de variantes et une traduction latine (Paris, 1897), pp. 91, 93; the book is now at archive.org here. 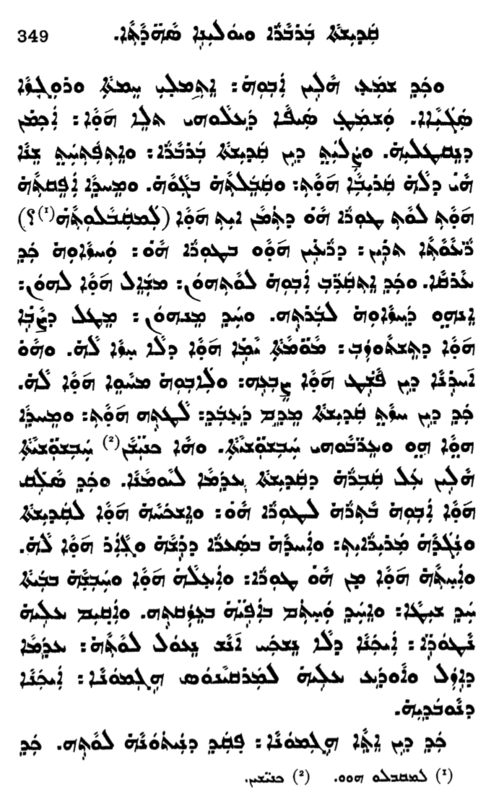 The Syriac text is available in two places. In 1900, Agnes Smith Lewis, in her still significant volumes on females saints in Syriac, gave it along with an English translation: Select Narratives of Holy Women, vol. 1 (Syr.) 104-105, vol. 2 (ET) 79-80. Unfortunately, her manuscript was illegible at a crucial part, and thus her translation is missing some words, but Bedjan’s previously published text (AMS III 348-349, which appeared in 1892) has it, and it is on the basis of his text that I give the translation below. 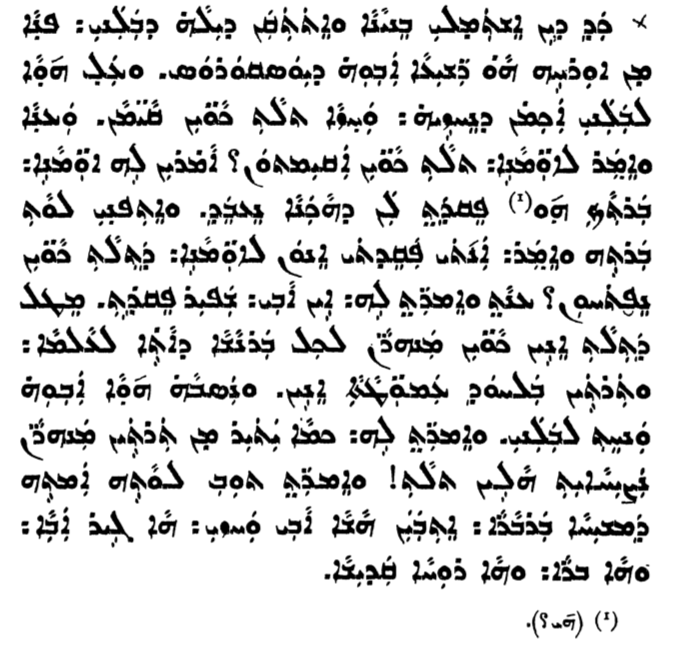 In lieu of typing out the Syriac text from Bedjan, here are the necessary images. When her father heard these things, he was filled with anger and great wrath, and he drew the sword that was hanging on him in order to kill her. But Saint Barbara prayed, and the crag that was near her opened up and received her within it and immediately put her out on the mountain that was there to receive her. Two shepherds, who were shepherding on that mountain, saw her fleeing, and when her father approached them, he questioned them whether they had seen his daughter. One of them, because he wanted her to be rescued, swore that he had not seen her, but the other one pointed his finger and showed her to her father. 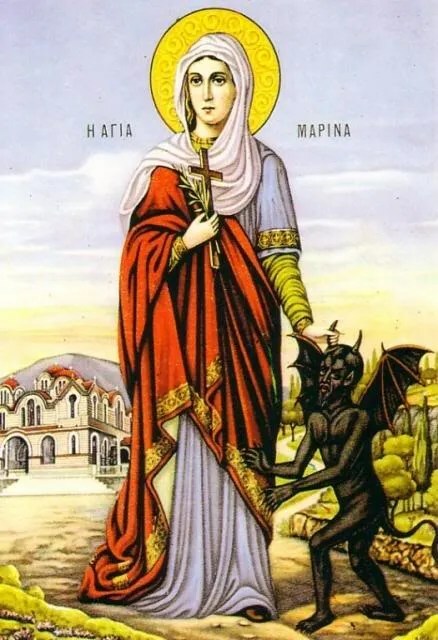 When the saint saw what he had done, she cursed him and immediately he and his sheep became beetles [ḥabšušyātā]: to this day these beetles congregate on the saint’s grave. As her father was going up the mountain after her, he found her and pulled her bitterly: he grabbed her by the hair of her head, drug her, brought her down from the mountain, brought her in and imprisoned her in a nasty room [ḥabšāh b-baytā ḥad šiṭā]. He closed and sealed [the door] in front of her with his ring, and he set guards over her, so that no one would be able to go in with her, until he went and informed Marcianus the governer about her, that he might eliminate her. Showing the Trinity in the window of her house. The sword does not frighten her, the iron saw does not harm her. Whom they hung up by her breasts.